My book SharePoint Online Exercises has been updated with a new chapter on modern sites, where I include many tips for use of these limited but easily created communication and team sites. The new chapter has a link to a kalmstrom.com Tips article with the demo below, which I hope will be a useful complement to the more detailed information in the book. SharePoint Online Exercises was first published in January 2017, but frequent updates are necessary as Microsoft develops SharePoint Online rapidly. Microsoft also removes things from SharePoint Online, and that is what will happen to the Visio Web Access web part on 30 September 2018. I had an exercise with this web part in the earlier versions of the book, but now it has been replaced with a modern sites exercise. Apart from the classic team site, which all SharePoint users have come to know, Microsoft has recently introduced a modern team site that is very easy to create. The modern team site is created from the SharePoint home page, so it doesn't require access to the SharePoint admin center. A modern communications site can also be created from SharePoint home. The modern sites have limitations, compared to classic sites and subsites, but there are also advantages apart from the easy creation. They adapt well to mobile devices, and an Office 3565 group is created automatically when you create a modern team site. Modern SharePoint sites are mostly used for short-term cooperation and announcements, for example around a specific project. It is however also possible to create a simple intranet with modern sites, and in the new exercise I show how you can get the navigation to work when there is no hierarchy and how you make it easily available to all users. Modern sites have no support for SharePoint add-ins and sandboxed solutions, so the kalmstrom.com SharePoint products can only be used on classic sites. The kalmstrom.com support team has however noticed a certain confusion among evaluators who are not clear about the difference between classic and modern team sites. For new users SharePoint can be overwhelming, but the kalmstrom.com support team is always there to explain and assist. Apart from the product development, we also help organizations to build and manage their SharePoint systems. 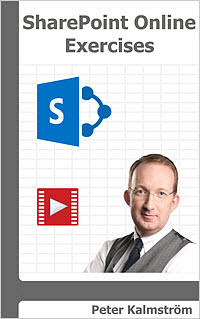 SharePoint Online Exercises can very well can be used stand-alone by readers who already have some knowledge about SharePoint, but for a more comprehensive learning I recommend to combine it with my book SharePoint Online from Scratch. While SharePoint Online Exercises contains a number of hands-on step-by-step instructions on how to create specific business solutions, SharePoint Online from Scratch explains in detail how SharePoint is built and how it can be used, from the very basic to advanced features. Both books are sold through Amazon, and they are available in paperback as well as Kindle e-book format. SharePoint Kanban Board - Sandboxed or Add-in?